Their surprise gift packs never disappoint! 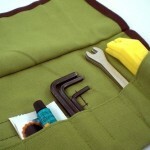 Packed full of locally made, bike-related goodies (like this awesome tool-kit sewn by one of the co-owners! ).